“In 1869 a weekly newspaper entitled the Sutton Coldfield and Erdington News was started by a few gentlemen who thought that a local organ of public opinion would be useful.” So wrote W.K.Riland Bedford, neglecting to mention that he himself was one of the founders. 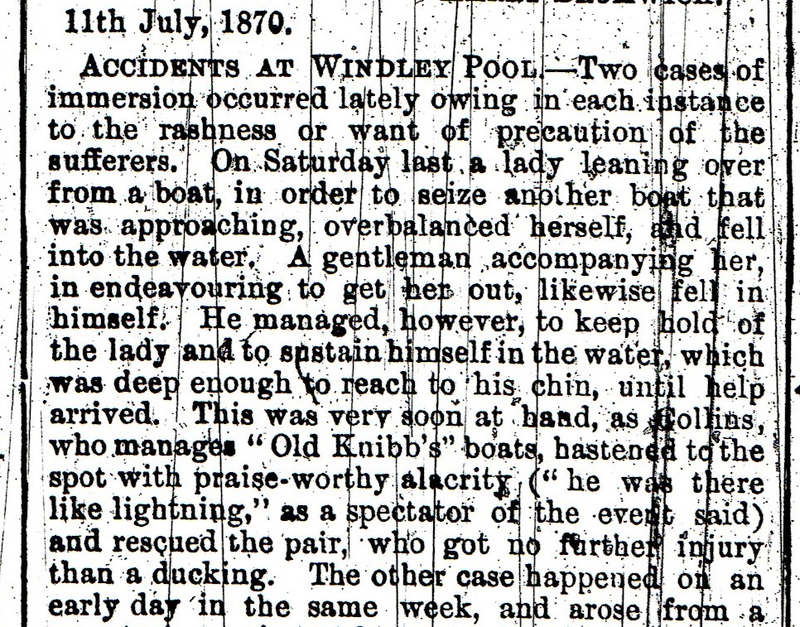 In January 1870 the paper reported on an entertainment at the Town Hall given by members of the congregation of the Parish Church, and there are also reports of Christadelphian and Methodist events. The Town Hall housed a reading room where there was a programme of penny readings, which were enjoyed by ‘Olivia’, who wrote to the newspaper in 1870 complaining of the lack of public amusements in Sutton Coldfield, and asking why a ball had not been arranged that year. Another disappointed letter writer reported on the South Staffordshire hunt: “we had a wretched day’s sport on Tuesday at Hams Hall. All the Hams coverts blank, ditto Moxhull, ditto Mr. Horsfall’s and ditto New Hall. We found a fox in Sutton Park later in the afternoon, but the foot people headed him and mobbed him, and he was killed instantly”. The newspaper listed seven hunt meetings, Atherstone on January 1, North Warwickshire Hounds on the third, fourth, sixth and seventh and South Staffordshire on the fourth and seventh. The same paper reported that 79 subscribers had resolved to revive the Sutton cricket club, but later in the year they may have regretted it. The Sutton eleven was all out for 26 against Handsworth, and in the same week Belgrave bowled them all out for 29. Other amusements to cheer ‘Olivia’ that year were a ball at the Royal Hotel in February and the re-opening of the Royal Parade Grounds, Clifton Road, on 14 May. These pleasure gardens, set up in 1868, were very successful, especially after the addition of the Crystal Palace in 1879. 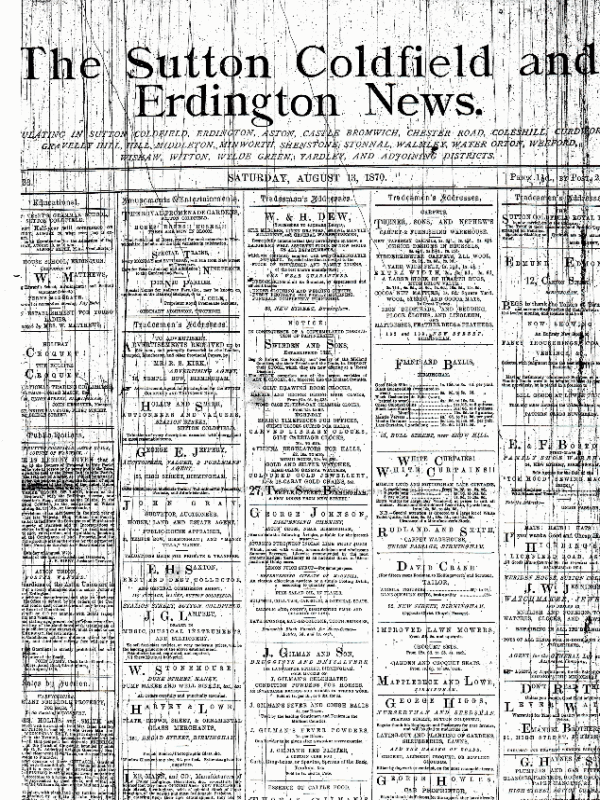 By 1890 the weekly newspaper had changed its name to the Sutton Coldfield and Erdington News and North Warwickshire Advertiser, but still with the same format. The bulk of the paper consisted of syndicated national news and features (including a column of excruciating ‘jokes’), several pages of advertisements, and a page of local news. For entertainment, in the January 4 issue, there are accounts of the Institute Ball, the Mutual Improvement Society gathering, the Fire Brigades’ annual dinner, and the Chrysanthemum Show. There was a two-day Conversazione at the Institute in the Town Hall, with 150 people attending each day. Football matches were now being reported, - Boldmere St. Michaels v. Old Veseyans at the Meadow Platt - and by April the last match of the season, Sutton Town v. Old Veseyans was being billed as the big local derby. There was a lawn tennis club and a swimming club with 105 members as well as cricket matches to report, but the talk of the town was the series of Maypole Fêtes, where schoolchildren performed round a maypole on Holly Knoll in Sutton Park, and took part in competitions. These were organised by the Mayor, Benjamin Stone, and others interested in the late Victorian Gothic Revival of folklore and tradition, and were very popular, raising large sums for charity. Front page and typical news item. Microfilm copies of these newspapers can be consulted at Sutton Reference Library, sometimes so scratched by careless use as to be unreadable.